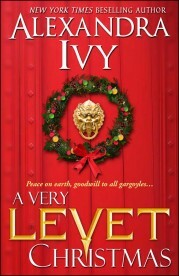 A gargoyle of Levet’s charm and intelligence should not be facing a solitary Christmas. True, he may appear a little unconventional—not to mention unconventionally little—even for a gargoyle. But what Levet lacks in height he makes up for in loyalty, and being banned from the festivities surrounding the Queen of Weres’ new pups is quite unfair. He loved the gaudy decorations. The caroling. The festive spirits of the humans. He didn’t know who invented the tradition of kissing beneath sprigs of branches, but they clearly understood how to celebrate a holiday. And this year there was even more to love. How long had he waited for Harley to give birth to her babies? It seemed like an eternity. But at last they were here. Five perfect babies. Three female and two male, who were the first pure-blood Weres to be born in decades. Which was why Levet had ignored the frigid weather and rushed from Chicago to St. Louis. Such a joyous occasion would no doubt include a grand celebration, with plenty of food and drink. And of course, for the first time in more years than he wanted to admit, he would be spending the holidays with his friends. A rare gift for a demon who’d been disowned by his family centuries ago. Now he wondered why he’d bothered. Standing on the bank of the frozen lake that edged Salvatore’s sprawling lair, he discovered his path blocked by a cur who was the size of a large mountain. Hess, the King of Weres’ right-hand mutt, wasn’t particularly bright, but he was impossible to get around. Especially if you happened to be a three foot gargoyle with more brains than brawn. Thoroughly annoyed, Levet folded his arms over his tiny chest, his large wings that shimmered in brilliant shades of blue and crimson with golden veins stretched out behind him. Hess narrowed his gaze, his breath sending out small puffs of icy fog. It was barely ten degrees but the cur was wearing jeans and a too-tight muscle shirt. 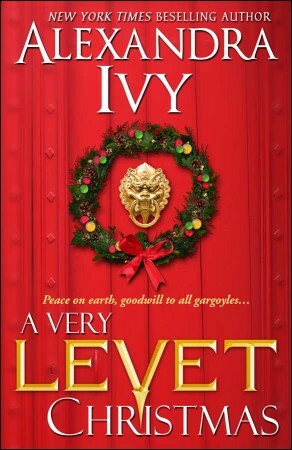 Levet rolled his eyes. Did Weres deliberately choose the stupidest humans to turn into curs? Hess gave low growl, reaching down to grab Levet by the horns and yank him off the ground. Hess leaned forward, his eyes glowing with a dangerous light. A cur didn’t have the same control over his wolf as a Were. The brute was on the edge of shifting. Something Levet would prefer to avoid. “You have two choices, gargoyle,” Hess warned. “Hey, my wings are magnificent,” Levet protested, deeply offended. “Or I rip them off and stuff them down your throat,” Hess ignored the interruption, his voice thickening and the air prickling with the heat of his wolf. “Why must dogs always be so violent?” Levet muttered. With one mighty swing of his arm, Hess tossed Levet onto the ice where he slid like a hockey puck toward the far edge of the lake. Smacking into the far bank, Levet tumbled end over end, at last coming to a halt near a large dumpster. Furiously cursing, he tugged his horns out of the snow, turning to glare at the house on top of the hill. Built with large windows overlooking the lake it was easy to see inside to the festively decorated home that was clearly filled with various demons enjoying Salvatore’s hospitality. He should be among the guests, he silently groused, his gaze shifting to the dark shapes that patrolled the area around the house. Harley adored him. Every female adored him. Besides, had he not just saved the world from Armageddon? They should all be bowing down to him in humble gratitude.